If the Kiss and Tell exhibition at Christchurch Mansion wasn’t wonderful enough, Ipswich has now got a second must-see show. The Women100 exhibition has just opened at the Ipswich Art Gallery in High Street. The Friends of Ipswich Museum were successful in getting a grant to fund the project, and the Council’s museums team has put together a great collection of 100 works by women artists from Ipswich and Suffolk. Most are from the Borough’s own collections. The exhibition celebrates the centenary of the first women getting the vote in 1918. What is clear is that the struggle of women artists for equality mirrors the struggle of women in many other fields, from science to medicine to politics. Two women were admitted into the Royal Academy of Art when it was formed in 1768 – Mary Moser and Angelica Kauffman. But, unbelievably, it was 168 years later before the next woman, Dame Laura Knight, was elected as a full member of the Academy in 1936. Even then, it took another 30 years before the men of the Academy allowed her to attend the Academy’s annual dinner. By this time, she was 84 years old, and had been a hugely successful artist for over 60 years! Her story is a telling one, and other women artists faced very similar discrimination. So, it is good to see that Suffolk’s own Maggi Hambling has, this year, been commissioned to create a public sculpture in Parliament Square of a woman described as the ‘foremother of feminism’ – Mary Wollstonecraft. Our Women100 exhibition contains works by Maggi Hambling, including her famous etching of Ipswich Museum’s Rosie the Rhino. 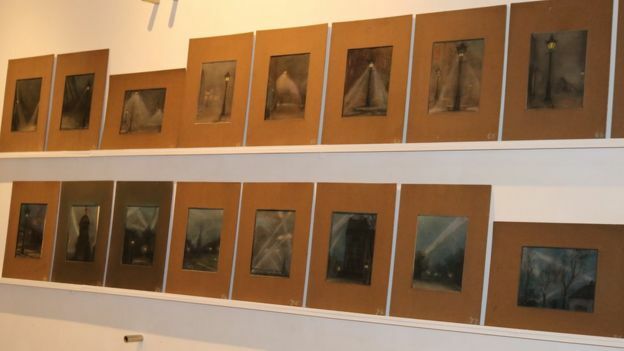 One room is filled with 70 pastel drawings of WW1 searchlights by Blanche Vulliamy who was born in Spring Road. There is a striking piece by Ania Hobson, from Framlingham. Ania is the winner of this year’s BP Portrait Young Artist Award, a hugely prestigious prize for a young artist. There are also works by Anna Airy, who was a war artist and the first woman president of the Ipswich Art Society. There are scores of great works to see. The exhibition is free, and open until April. Make sure you don’t miss it!